This week wasn’t as bad as I thought it was going to be. I had a lot of fun will my assignments. My favorite assignments this week were probably watching the cinematic technique videos and creating my own tutorial. The cinematic technique videos weren’t what I was expecting. I was expecting some old guy talking in a monotone voice for a long time, but instead I watched three fun, educational, short, and exciting videos. Also, creating my own tutorial was fun because I got to use this “Snipping Tool” my fiance put on my computer a while ago. This week, one of the things I learned and had fun doing was using the “Insert/edit link” button when writing my blogs. I found out you can highlight words, click on the button, and insert a URL so when you click on the word you go to the page you’re talking about. It’s amazing! I finally know how to and now I want to do it to everything. I have too much fun with the little things in life. Furthermore, my most difficult task I had to complete this week was my video assignments. Window’s Movie Maker on my computer was giving me the hardest time trying to convert my video to YouTube and my Blog. It took me and my fiance about an hour to try to figure out how to change the file extension. We were thinking too hard about it and started trying to download all sorts of things to try to convert it. Thankfully we figured it out and I was able to upload my video assignments to my blog! For my “create your own Digital Storytelling Assignment,” it took me a while to try to think of a good one that I haven’t seen. Luckily after brainstorming, I came up with creating your very own logo. I did the assignment myself in order to test it out and I found it fun, creative, and only slightly challenging. This week I feel that I completed the requirements and did well on them. I put a lot of time into this course and all of its work. Technology has to be one of my weakest points but I am eager to learn and I truly want to continue to learn more. This week I wouldn’t do anything differently, except manage my time a little better (I’m getting better at it but I still need a little more work). I don’t have any questions at the moment. Finally, I hope you enjoy my work and I hope you had a great week! 2) Cinematic techniques: Kubrick, The Shining, and Tarantino. Create your Own Digital Storytelling Assignment. 1) Changing the color tint on Paint. 3) Make a support poster. I commented on Tommy, Amanda (x2), and Courtney’s (x2) Blogs. Tommy and Amanda commented on my Blog this week. I replied to Tommy’s comment on my Blog. “You will now analyze the clip by watching it three times, in different ways.” I chose the scene called Escape (4th scene) by the movie Pirates of the Caribbean: On Stranger Tides. Analyze the camera work. “Before watching the first time, turn the volume on the clip (or on your computer) all the way down. Take notes on the visual aspects of the clip.” I love this movie and I think the film work on this movie is great! The camera angles were perfect. In the beginning of the clip (you can click the link provided above on the movie name) you see Captain Jack Sparrow on top of a carriage and the camera is at a low angle him looking up at him and looking down on everyone else. This portrays Jack as a dominant character. According to Roger Ebert’s article How to Read a Movie, “Extreme high angle shots make characters into pawns; low angles make them into gods.” The light was mostly consistent the whole clip. The light did a great job clearly showing the characters and objects in the clip. During the clip I didn’t notice any shadows. The camera switches view quite a few times; I tried to count and concluded that the camera gets just about every angle of Jack (the main character). Transitions from people and places were quick but they flowed well with what was happening in the clip. The camera guides the story very well. Jack’s Escape scene is fun, exciting, and thrilling! The camera mostly did close up shots during this clip. The characters were great actors and the film maker definitely knew what he/she was doing. Analyze the audio track. “Now turn the volume up, but play it without looking at the screen (or turn off the screen); just listen to the audio.” There was very little dialogue during this clip. This clip was dominated by sounds and music. The little dialogue the clip had contained good pacing and spaces in the audio. The music helped make the action and events taking place flow. Just by listening to the audio, you can tell what was going on in the clip. It was incredible! I didn’t realize that, just by listening alone, you can follow along with the story line and you can imagine what was going on. The music really intensified the scene’s exciting mood. Put it all together. “Finally, watch the scene as normal. Pay attention to something you may have missed the first time or how the elements you saw in the first two steps work together. Did you notice anything new by minimizing one of your senses?” The video and audio elements from this scene work very well together. They both compliment one another when you watch the movie with both sound and video. The interesting but great thing is that without each other, you can still understand what is happening in the scene! I never realized how well you could follow along with a movie using only hearing or sight. “The way the scene is shot builds the story element.” The one thing I noticed from watching it a third time was at the end, the typical Pirates of the Caribbean song (or close to it) plays. This theme song of theirs is typically played during action scenes, such as the scene Escape. Also, towards the end of the clip when he is driving the coal carriage, Jack is on the right and the driver who ends up jumping off is on the left. According to Roger Ebert’s article, “in a two-shot, the person on the right will “seem” dominant over the person on the left.” In the case of this film, Ebert’s theory is true because Jack is the dominant character and takes over the driver’s carriage. Stanley Kubrick // One-Point Perspective: Kubrick’s short video is all about having a center focus. It has a lot to do with symmetry in a film shot. 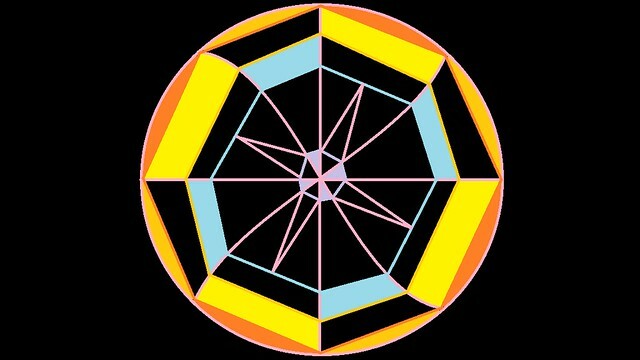 This symmetry draws the viewer’s eyes to the center and main focus of the picture. This video had music, no sound, and very short clips from (what looks like) scary movies. In conclusion, Kubrick might be trying to tell us that symmetry is popular and effective in scary movies. The Shining // Zooms: Ian Kammer’s video focuses on zoom clips from the movie The Shining. His “synchronized collage of every zoom” in the movie is dramatic thanks to the music Kammer added to the video. The zooming technique of the filmer draws the audience into the scene and gives off the impression that something is about to happen. Some of the views Kammer showed seemed scary. Furthermore, the more zooms Kammer showed at once, the harder it was to try to keep up on what was going on. My only advice for Kammer is to show a maximum of a couple clips at a time because it can be overwhelming trying to watch all of them. Tarantino // from Below: This video is compiled of short movie clips from a low angle looking up at the actor(s). Some of these clips seem to be dramatic and some show a person (or people) of dominance or power. There were a lot of different movie clips in this video so I didn’t get any more information about filming out of watching it. Although I did enjoy the different clips, expecially the ones from the movie Pulp Fiction. Roger Ebert’s “How To Read A Movie” is about freezing the movie and analyzing what you see. His methods seem to work and can be quite effective. Ebert believes: “To reduce the concept to a crude rule of thumb in the composition of a shot in a movie: A person located somewhat to the right of center will seem ideally placed. A person to the right of that position will seem more positive; to the left, more negative. A centered person will seem objectified, like a mug shot. I call that position somewhat to the right of center the “strong axis”.” … “In simplistic terms: Right is more positive, left more negative. Movement to the right seems more favorable; to the left, less so. The future seems to live on the right, the past on the left. The top is dominant over the bottom. The foreground is stronger than the background. Symmetrical compositions seem at rest. Diagonals in a composition seem to “move” in the direction of the sharpest angle they form, even though of course they may not move at all. Therefore, a composition could lead us into a background that becomes dominant over a foreground. Tilt shots of course put everything on a diagonal, implying the world is out of balance. I have the impression that more tilts are down to the right than to the left, perhaps suggesting the characters are sliding perilously into their futures. Left tilts to me suggest helplessness, sadness, resignation. Few tilts feel positive. Movement is dominant over things that are still. A POV above a character’s eyeline reduces him; below the eyeline, enhances him. Extreme high angle shots make characters into pawns; low angles make them into gods. Brighter areas tend to be dominant over darker areas, but far from always: Within the context, you can seek the “dominant contrast,” which is the area we are drawn toward. Sometimes it will be darker, further back, lower, and so on. It can be as effective to go against intrinsic weightings as to follow them.” If you sit down with a bunch of average people and stop a movie to analyze it, people will typically discuss “color, lighting, shadows, construction, characters, dialogue, acting, history, sources, influences, and messages both obvious and buried. Anything and everything.” Ebert seems to have effective methods that are backed up by evidence from numerous movies. I have never thought about freezing a movie to analyze it in such a way Ebert talks about, but now I am interested in doing so. “How awesome is this? Make your own and show us!” Today we are asked to make a hyperbolic tiling photo! I looked up examples on google images and I found a lot of different and fascinating photos. I used Paint on my computer and created my very own hyperbolic tiling photo. It was pretty easy and I enjoyed this little project! “Take a photo that shows us magical light.” I took this photo one night when I drove home. 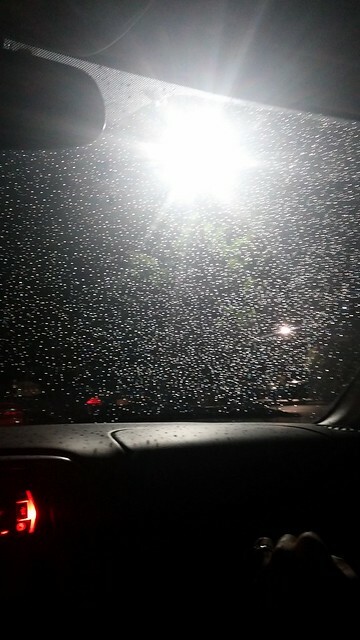 The light is coming from a sidewalk lamp and it just rained (that’s why there’s rain drops on my windshield). I thought this picture was so entreating and magical! Enjoy! Daily Create: Make a support poster! I looked on Public Domain Review’s website and found an article called The Serious and the Smirk: The Smile in Portraiture. (http://publicdomainreview.org/2013/09/18/the-serious-and-the-smirk-the-smile-in-portraiture/). 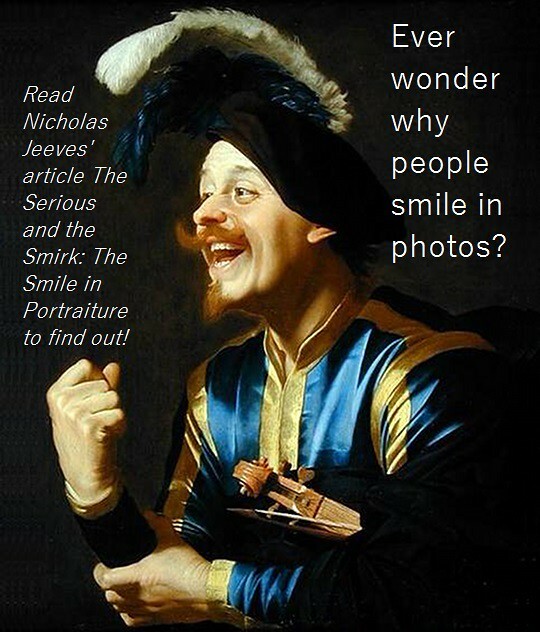 In this article, “Nicholas Jeeves explores the the history of the smile through the ages of portraiture, from Da Vinci’s Mona Lisa to Alexander Gardner’s photographs of Abraham Lincoln.” He answers the question most people don’t know the answer to: “Why do we so seldom see people smiling in painted portraits?” We need to promote this article because it helps to inform the public of a gradual historical event that changed the way the majority of the population poses in photos; and best of all, it does this for free! “Today when someone points a camera at us, we smile. This is the cultural and social reflex of our time, and such are our expectations of a picture portrait. But in the long history of portraiture the open smile has been largely, as it were, frowned upon.” Read this intriguing article and learn the history of the smile! The following photo was taken from The Serious and the Smirk’s article and I used Paint to make it a promotable image. The photo was called The Laughing Violinist of 1624.